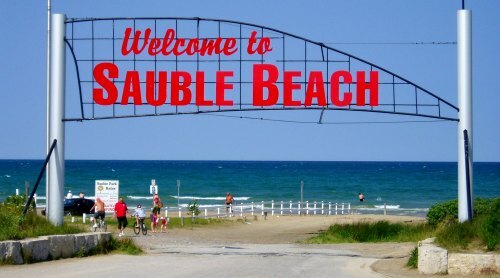 The entrance to the lake shore greets everyone with a warm Welcome to Sauble Beach! I remember spending summers in Sauble Beach camping as a kid. I remember Sauble when there was a dance pavaillion holding weekly dances. Part of the draw was the open ceiling so you could dance under the stars. Sauble was a favoured hang out of Hippies in the 60's and continues to be a favourite beach for young people today. It is unique as a place where you can park directly on the beach although long gone are the days when you could do this for free and drive all over the beach. Sauble beach is great for swimming although is an area where you should watch the undertow closely. It is a great place for body surfing when the waves are crashing in. Much like some of the communities further north along the Lake Huron Shore Sauble has become one of the beaches kite boarders. 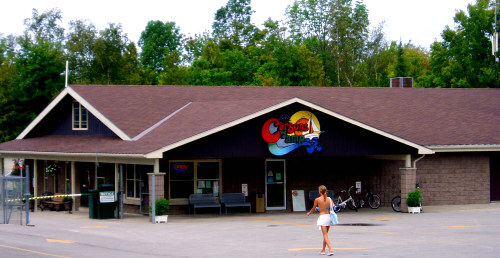 The main strip in Sauble that you take to get to the beach is lined with beach shops, arcades and fast food. Its somewhere that getting an order of fries and a milkshake is gourmet. But watch out for seagulls looking for a free meal. BBQ and beach fry go hand and hand with a day at the beach. Sauble Beach camping is sought after for long weekends and summer holidays. You can find everything from campsites that are only available for long weekend parties to established campgrounds like Carsons, Woodland Park and Sauble Falls Provincial Park. Just because there are an influx of young party goers on long weekends you should not count out Sauble Beach cottage rental. Once you get away from the main strip Sauble Beach is great for families. Kids will love the Sauble Beach Fun World (formerly Sauble Beach Amusements) - a favourite of my kids when they were younger for go karting and water slides. In addition you can rent sea doos on the beach or go for banana boat rides. If you are looking for something a bit more adventurous try a helicopter ride over Sauble Beach! Sauble Beach isn't just about the lake shore. 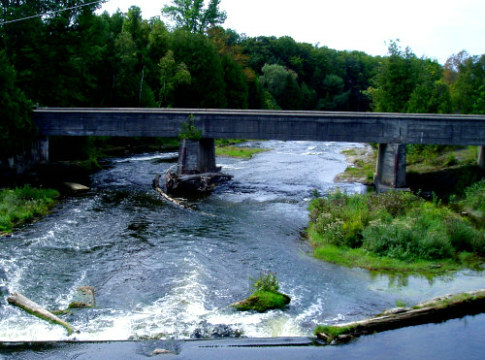 Sauble River is home to the Sauble Falls provincial park and many swim in the rapids at the base of the falls. Once a town that was deserted in the Winter months, Sauble Beach is now home to year round residents as people choose to retire in this Lake Huron beach town. Sauble being the french word for sand indicates that the main pull of this Ontario cottage town is definitely its beach.